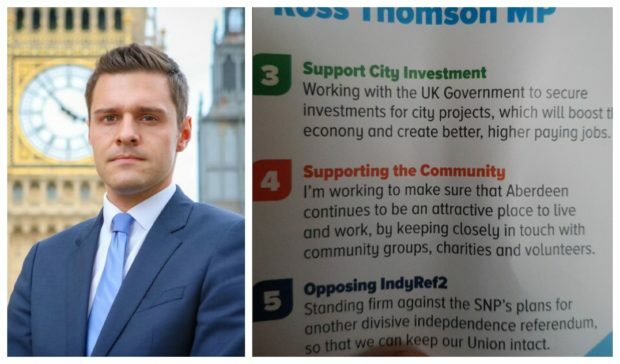 The leaflet, which details the Scottish Conservative MP’s plan for the future, sees the word “economy” spelt “econony” and “independence” spelt “indepdendence”. The blunder has drawn much criticism on Twitter with users quick to point out the error. This is the latest in a series of gaffes made by Mr Thomson. In December last year, he was tricked by an “underhanded” television crew into believing a fake drug app exists that supports fictional children working in a Colombian cartel’s “cocaine factory”. And in April, he posted a smiling photograph of himself on the throne of Iraq’s former dictator Saddam Hussein, where he joked about channelling his “inner dictator”. SNP MSP Gillian Martin was quick to respond, accusing the Mr Thomson of “trivialising” the atrocities committed by the dictator.